This meatloaf is really delicious! I've read the great reviews about this meatloaf from Paula Deen's website and knew that I will just have to try it. I'm so glad I did. Meatloaf has been on my list of to try for ages, and what better recipe to start with, other than Paula Deen's, especially when those who have tried it, raves about it! I have used about 600gm of ground pork instead of beef. Mix all the ingredients together ; pork, ground black pepper, chopped onions, chopped bell pepper, egg, canned diced tomato (drained), and oats (which I've used rolled oats) till evenly combined. Season with some salt, and I tested a teaspoon by frying it with a few drops of oil in a small saucepan, to check on the seasoning. You would not want to bake the whole meatloaf and then discovered later that it is under-seasoned! Adjust the seasoning accordingly, if needed. As soon as I've tasted it, I knew that this meatloaf is going to be good! So tasty! To make the sauce for the topping, combine tomato ketchup, brown sugar and prepared mustard (I've used Dijon mustard). Place the meat mixture in a baking loaf pan, (size 8-1/2" x 4-1/2"). Level the top, and spread the sauce topping over it. I've spread half of the sauce over the meat, and at halfway thru baking time, the top remains just as moist, so I've added about only a quarter more of the sauce over and continue baking until done. Bake in a preheated oven at 375F for 1 hour. Since I've used more amount of meat that the recipe calls for, I've baked the meatloaf for an additional 20 minutes. Let cool in pan, and turn it out gently on to a plate. The meatloaf is so moist, and very tasty. Delicious! At first, I thought that the top would be dry at the end of baking time, but it remains just as moist. I made a little bit more of the sauce, and we had the meatloaf plus the extra sauce, with plain white rice, and some stir-fry green veggies. Yummy! Mix all meat ingredients well and place in a baking dish. Shape into a loaf. I'm linking this post to Cook Like A Star event, featuring Paula Deen and The Deen Brothers, hosted by Zoe of Bake For Happy Kids, Diana of Domestic Goddess Wannabe and Joyce of Kitchen Flavours. This shall be my last post for "Cook Like A Star - Paula Deen and The Deen Brothers". I would like to thank everyone who has joined us, there are still two more days if you would like to submit your posts. Cook Like A Star's next featured chef is Gordon Ramsay, in the month of August, Bring out those Gordon Ramsay books off your shelves and start cooking! Link your posts to the following hostesses ; Zoe of Bake For Happy Kids, Baby Sumo of Eat Your Heart Out and Mich of Piece of Cake. It's time for our Bake-Along #63. My baking buddy, Zoe has selected Crisp Chocolate Bites to bake together with Lena and myself, and anyone who wishes to bake along with us. When this cookie was selected by Zoe, I immediately thought of Christmas! And while I was baking this, the song "Rudolph The Red Nose Reindeer" kept popping into my head, and before long, I find myself singing while making these cookies! LOL! Crisp Chocolate Bites, you'll be biting into one and reaching for the next one! The cookie dough is really, a thick batter that needs to be refrigerated for at least an hour to firm up. It will turn into a very thick-set fudgy batter! Shape the fudgy batter into 3/4-inch balls, but I used a small ice-cream scoop to scoop the thick batter and drop the rounds into a bowl of sifted icing sugar, roll to coat it completely. Place the balls on prepared baking pans and bake for 12 minutes until the cookies puffed and cracked on top. The balls of cookie from the small ice cream scoop I used is a little bigger than the size mentioned in the book, so I got only 25 cookies (and sizes varies, some are smaller than others, guess I'm not consistent when scooping the batter! ), and I baked them for 17 minutes. The only change I did was to reduce the sugar to half for the batter, which works out just nice for me, not to sweet. While baking in the hot oven, the cookies spread out and cracked, making nice patterns on the surface. Or maybe they cracked, due to my singing? HAHAHA! These cookies are really crispy on the outside, with the sound of crispy crunch as you bite into it, but not all of these cookies are crispy like this. I noticed that the smaller ones are really crispy and the bigger ones are somewhat cake-like in the centre. I did not re-bake the bigger ones again, as they are good to eat too, with really crispy crunch on the outside. I'm glad I've reduced the sugar. The chocolaty, not too sweet cookies really goes well with the icing sugar that coats around it. Really nice! Eating these cookies, reminds me of eating whoopie pies, the crispy version! Lightly grease 2 baking sheets or line with parchment (baking) paper. Set aside. In a small saucepan over very low heat, combine the butter and chocolate. Heat, stirring occasionally, just until melted and smooth. Pour the chocolate mixture in a large bowl and let cool slightly. Stir in the granulated sugar until evenly moistened. Add the egg and vanilla, beating until light and fluffy. Sift the flour, cocoa, baking soda, and salt together onto a sheet of waxed paper. Gradually add the flour mixture to the chocolate mixture and stir to combine. Cover and refrigerate until firm, about 1 hour. Preheat the oven to 375F (190C). Remove the cookie dough from the refrigerator. Shape the dough into 3/4-inch (2-cm) balls and roll in the confectioners' sugar to coat completely. Place the balls about 1-1/2 inches (4cm) apart on the prepared pans. Bake the cookies until puffed and cracked on top, about 12 minutes. They may appear underdone in the center but will turn crisp as they cool. Let the cookies cool on the pans on wire racks for 2-3 minutes before transferring them to the racks to cool completely. For our next Bake-Along, our bake is "Theme : Chiffon Cake". Bake any chiffon cake and link your post to the linky which will start on 10th July until 19th July. Everyone is welcome! The kids requested for pasta dinner last week. Found this easy recipe from The Deen Bros. website. I made the sauce a few hours earlier, which is a time saver. I have a few extra hours in the evening, and managed to clear some stuffs from my potted garden which I've been postponing for weeks. When it was almost dinner time, I simply cook the spaghetti till al dente, reheat the sauce and dinner is ready. The meatball takes only minutes to mix and shape into balls. They are then fried in a little oil till brown all over, and even though the recipe calls for marinara sauce, I have used spaghetti sauce with basil, which is poured into the saucepan. You can use any of your favourite sauce. I have added in a can of button mushrooms, roughly sliced. Bring the sauce to a simmer, turning the meatballs now and then, for about 20 minutes. Season with some salt and pepper if necessary. Keep warm, and reheat just before serving. The meatballs are really delicious, especially so, before the sauce was added in. I fried one meatball to check on the seasoning, and they were so good! My son was asking for more and was disappointed that the rest was cooked with the sauce. Serve with some sprinkling of grated Parmesan, and some shredded basil leaves. A very nice meal, quick, simple and yummy! In a bowl, combine the beef, Parmesan cheese, bread crumbs, egg, house seasoning and oregano. Use your hands to form the mixture into 2-inch round meatballs. Heat the oil in a large skillet over medium-high heat. Add the meatballs and cook, turning occasionally, for 5 to 10 minutes total, or until golden brown. Add the marinara sauce and reduce the heat to medium. Simmer for 15 to 20 minutes, or until the meatballs are no longer pink. Cover and keep warm. Bring a large pot of salted water to a boil. Cook the spaghetti according to the package directions. Drain well. Divide the spaghetti among four shallow bowls and top with the meatballs and sauce. Garnish with Parmesan cheese. I'm linking this post to : Cook Like A Star event, featuring Paula Deen and The Deen Brothers, hosted by Zoe of Bake For Happy Kids, Diana of Domestic Goddess Wannabe and Joyce of Kitchen Flavours. The Home Bakers (THB) bake #37, for this week is Fresh Pineapple-Macadamia Nut Upside-down Cake, selected by Alice of I Love.I Cook.I Bake. I should really call this cake as Canned Pineapple-Macadamia Nut Upside-down Cake, as I've used canned pineapples. I actually bought a whole fresh pineapple, and it wasn't quite ripe yet, so I kept it for a few days, waiting for it to ripen. When the pineapple has gone all yellow and ripe, I was surprised to find it has gone rotten inside, almost half of it. Since I can't use it for my bake, I bought a can of pineapple rings instead. The recipe states to use a heavy based ovenproof 9" skillet to heat up the butter, then brown sugar is added in together with corn syrup, stir till the sugar has melted and mixture bubbles. Since I do not have a heavy based skillet, I have used a 9" cake pan instead, and it works out fine. Place the pineapple slices over the mixture and scatter some macadamia nuts in spaces between the pineapple pieces. I have used just a minimum amount of nuts, as the family are not fond of nuts in bakes. The batter is pretty straight forward. Start with the usual creaming of butter and sugar, then eggs are added in, followed by the vanilla extract, then the flour in two additions with some milk. Spread the batter over the pineapples slices, and bake for 35 minutes. Remove, let cool in pan for 2 minutes, and turn it out onto a plate. May serve either warm or at room temperature. - reduced the brown sugar for the fruit layer to 1/3 cup. - reduced the granulated sugar for the batter to 1/3 cup. I sliced the cake while still warm, smells nice! I like the pineapples slices. The cake is very moist with soft crumbs. I'm glad that I've reduced the sugar, as the sweetness is just right. The macadamia nuts are really crunchy! A very nice cake, to enjoy with a cup of tea. For the full recipe and instructions, please visit the host of this bake, Alice of I Love,I Cook.I Bake. 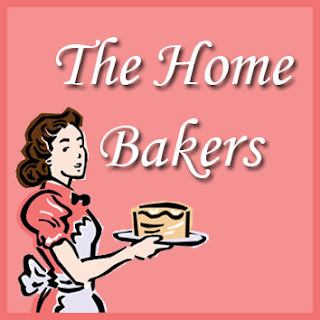 To view other members' bake, please visit The Home Bakers (THB). We are a group of home bakers who are currently baking from "Coffee Cakes" by Lou Seibert Pappas. This is our bake no. 37 and we have 23 recipes more to go. If you are interested to be a member and join in our bakes, you may drop me an email at kitchenflavours@yahoo.com. "June Potluck"! 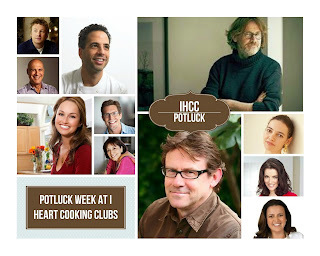 It's potluck time at I Heart Cooking Clubs (IHCC). I've already bookmarked dozens of recipes to try from Nigella Lawson, Yotam Ottolenghi, Madhur Jaffrey, Giada de Laurentiis and the rest of IHCC's previous featured chefs, but find myself cooking from Nigel Slater's recipe this week. I made this dish Chicken with Garlic and Oyster Sauce for one of our weeknight dinner, because it is quick and easy, especially with the unbearably hot weather which we are experiencing again, with no rain for the last few weeks, I would not want to stand over a hot stove for hours in a steaming hot kitchen. And stir-fry dishes is the fastest and easiest to cook, perfect to serve with our usual dinner of rice and veggies. I've cooked this dish twice actually, the first time using pork as per Nigel's recipe. The second time, I cooked it with chicken breast fillet, and I prefer the chicken version. I have always marinated chicken breast meat with a little cornflour and a little amount of water, as this will help to tenderize the chicken breast fillet which would tend to be dry and a little tough, especially when served later, at room temperature. This stir-fry dish is really easy and takes only minutes to cook. Nigel has used 3 heaped tablespoons of oyster sauce, but I have used only about slightly less than 2 tablespoon. When it comes to oyster sauce in Chinese cooking, more does not always mean tastier, as the sauce is really salty and sometimes too much of it can spoil a dish in terms of taste and flavour. Maybe Nigel has used a brand that is less salty. The amount can easily be adjusted depending on the brand that is used. I've used fresh shiitake mushrooms and more than the recipe calls for, about 400gm as the mushrooms tend to shrink in size when cooked, as their delicious juices would be released into the gravy as it cooks. And I've added in about 1/4 cup of water for more gravy to eat with rice. A nice dish to serve with plain white rice, makes an easy and quick stir-fry dish on busy weeknights. Heat the wok. Add 2 tablespoons of oil. When it starts to smoke, add half the meat and let it colour, removing it as it turns golden at the edges. Repeat with the second batch of meat, using a little fresh oil if you have to. Meanwhile, peel and finely chop the garlic and peel and slice the shallots. Finely chop, but do not seed, two of the chillies. Leave a couple whole to add a deeper, subtler flavour. Get the wok hot, pour in the remaining oil and let it start to smoke, then add the chopped garlic, shallots and chillies, stirring as they cook. Fry them for a minute or two till they start to colour. Add the mushrooms, whole or torn up if they are large. Continue stir-frying till they are soft and lightly coloured, then return the meat to the pan. Once the meat is thoroughly hot, stir in the oyster sauce and the wine and bring to the boil. Let the resulting sauce reduce for a minute, maybe two, then serve. The second time I cooked this dish, I've used chicken breast meat. Sliced the chicken breast fillet and marinate with 1 tablespoon of cornflour and 1 tablespoon water. Stir till meat is thoroughly coated with the cornflour. Set aside for 10 minutes and then proceed with the frying as per the recipe above. By adding a little cornflour to the chicken breast fillet, it helps to tenderize the meat during cooking and keeping it moist, as chicken breast meat tend to dry out and gets stringy especially if cooked for a long time. I have used slightly less than 2 tablespoons of oyster sauce, as 3 tablespoons is a little too much and salty for my taste. I mixed the oyster sauce and the wine with an addition of 1/4 cup water, as I wanted more sauce to eat with rice. I am "going" on a picnic and I'm bringing Ham Cheesy Patties that begins with the letter H. For those of you who are familiar with Louise, the lovely lady from Months of Edible Celebrations, would know about this on-line picnic called, The Picnic Game, that Louise is hosting each June, with the final round-up on 1st July. If you are new to The Picnic Game, hop on over to Louise's for more details. June 18th is International Picnic Day and Louise has invited us for a picnic game from 18th to 28th June. And I'm "going" on a picnic with Louise and all the lovely ladies who has joined in the fun. This is the third year that I'm joining in The Picnic Game. The game is played by selecting a letter and you are supposed to make some food beginning from your chosen letter, to the picnic. The chosen letter will be confirmed and assigned to each person by Louise, like in my case, I chose the letter H, and it is for Ham Cheesy Patties. And that's not all, each of us must list what the other persons before your letter, are bringing! It is a fun on-line picnic game! Let's take a quick look at how these patties are made. Firstly, make the shortcrust pastry (refer to the recipe below). Roll out the pastry dough and cut out rounds and place the rounds in greased tart moulds, trimming the edges to fit mould. For the filling : Alex Goh has given the option to include some meat, and I have used chopped ham. The sliced onions are suateed until soft, then the ham are added in, stir-fry for 2-3 minutes. Dish out to a plate and set aside to cool. Place some of the onion-ham mixture into each of the pastry cases, sprinkle some chopped spring onions and pour over the custard to almost full. I sprinkled more black pepper over the top. Bake in a preheated oven at 200C for 25 minutes until custard is puffy and golden brown. For the custard : Whipping cream and milk are heated up until hot, stir in grated Cheddar cheese until cheese melts. Remove from heat, and gradually whisk in the lightly beaten eggs, whisking the mixture briskly while pouring in the egg to avoid curdling. Whisk until mixture is smooth, add in some salt and black pepper to taste. Let patties cool in their tart cases to slightly warm. The custard filling will settle down as they cool. This single recipe yields 16 patties. Serve them slightly warm, they are so darn good! Delicious! The pastry is really very buttery, and crispy-tender when eaten warm. And the filling is so tasty! These patties are really mini quiches. Though I would suggest eating these patties while still warm, they are really good too, when eaten at room temperature. Perfect to bring for a picnic or a get-together. We had this for breakfast the next morning, simply reheat them in their tart moulds at 180C for 10 minutes and they are just as delicious! Roll out the pastry dough between 2 sheets of plastic wrap (or place on a lightly floured work surface with a plastic wrap over the top) to 3mm thickness. Cut it out with 4-inch round cutter. Line the greased tart moulds with the cut-out pastry, pressing against the base and sides of the mould, and trimming off any excess at the rim of moulds. Heat the oil in a saucepan. Add the sliced onions and fry until brown and soft, about 8 minutes. Add in the chopped ham and stir-fry for another 2-3 minutes. Set aside to cool. Mix milk and whipping cream in a small pot, over a medium heat until mixture is just hot. Add in grated Cheddar cheese and stir until cheese melts. Remove pot from heat and gradually add in the lightly beaten egg stirring the milk-cheese mixture briskly, so as not to curdle the eggs. Stir until the mixture is smooth. Add some salt, black pepper and ground cinnamon to taste (taking into account that the cheese might be salty). Divide the onion-ham filling equally among the tart moulds. Sprinkle some chopped spring onions over each tart. Pour the custard over until almost full. 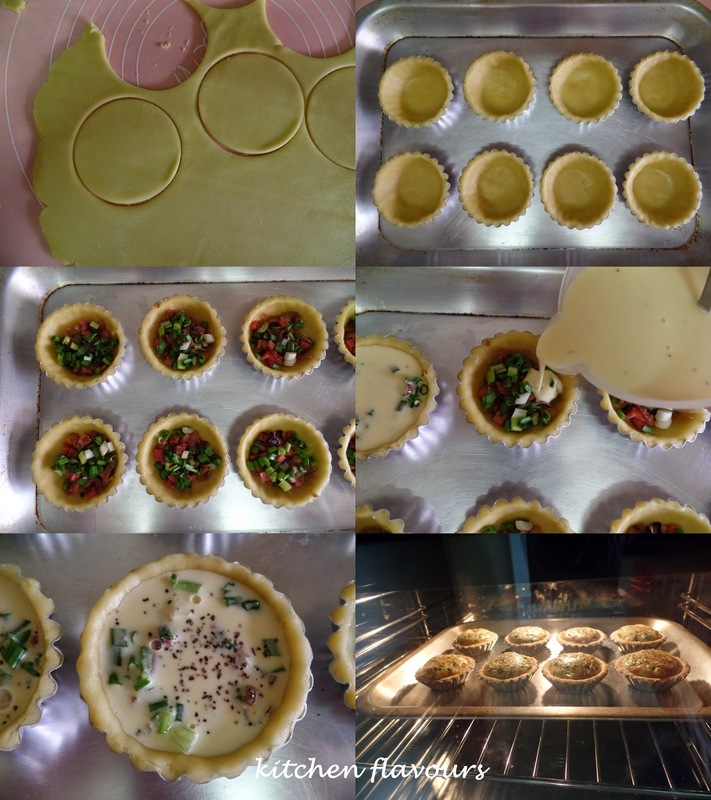 (I sprinkled some black pepper over each tart before baking). Bake in a preheated oven at 200C for 25 minutes or until golden brown. Custard will puff up during baking and it will settle down upon cooling. Cut the butter into small pieces and mix it with the flour till crumbly. Add in salt and then water (adding 1 tablespoon at a time, I used only about 1-3/4 tbsps, using iced-cold water). Mix to form a dough. Shape into a ball, press it into a flat disk, wrap with plastic wrap and keep refrigerated for 30 minutes. It is baked in a springform pan, and Rachel has given a useful tip to use the base of the pan upside down, so that there's no lip at the sides of the base removable bottom, and the cake can be slide off easily after baking. Recipe says to bake the cake for 30 minutes, then add on the topping, which is to be prepared about 5 minutes before the cake's 30 minutes is up. A cake tester inserted in the middle of cake is supposed to have some moist crumbs on it before the topping is added, but my cake tester is clean when I inserted it in the cake at 27 minutes, so it would be a good idea to check on your cake earlier. To prepare the topping, melt the butter in a saucepan over medium heat, add the rest of the ingredients, sugar, flour, cream, vanilla extract and flaked almonds, letting the mixture bubbles for a minute. Spread the mixture evenly over the hot cake, and continue to bake the cake for another 10-15 minutes until the almonds are golden brown. I sliced a piece when the cake is still slightly warm, as it smells so good with the almonds! The cake turn out moist with tender crumbs, and the almonds are crunchy, a little sweet, buttery and smells good! The next time, when I make this again, I would reduce slightly, the amount of sugar for the topping, it is a little sweet for me, but it would probably be just right for those who love their dessert a little sweet. If you love almonds, then you just got to give this cake a try! Preheat the oven to 180C (350F), gas mark 4, then grease the base and sides of the cake tin with butter and dust with flour. If you're using a spring-form tin, make sure the base is upside down, so there's no lip and the cake can slide off easily when cooked. Using a hand-held electric beater or an electric food mixer, whisk together the eggs and the sugar for 5-7 minutes or until thick and mousse-like. Sift in the flour and baking powder and pour in the vanilla extract, milk and melted butter, then fold everything in until combined. Tip the mixture into the prepared tin and bake for 30-35 minutes or until a skewer inserted into the center of the cake comes out moist but not totally clean, as the mixture will still need another 10 minutes of cooking. Increase the heat to 200C (400F), Gas mark 6. Just before the 30-35 minutes are up, make the topping. Place the butter in a saucepan over a medium heat. When it has melted, add the remaining ingredients and bring to the boil, allowing the mixture to bubble away for 1 minute. After the cake has been cooking for 30-35 minutes, remove it from the oven and spoon the almond mixture evenly over the top. Place it back in the oven and bake for about 10-15 minutes or until the topping is golden. Leave to cool in the tin for 10 minutes. Then, using a small, sharp knife, loosen around the edges and carefully remove the sides of the tin before placing the cake (still on the base of the tin) on a wire rack to cool down fully. To transfer to a plate, use a palette knife to loosen the bottom of the cake from the tin, then slide the knife under the cake and ease it onto the plate to serve. I made this salad a few weeks ago when we had this baked chicken for dinner. This is a really simple salad, easy and quick to put together especially if you are rushing for time when preparing the main dishes. Another lovely recipe from The Deen Bros. Recipe uses romaine lettuce, though any lettuce can be used, and here I have used Green Coral Lettuce, with Honey Cherry Tomatoes and some Japanese cucumber. The Ranch Dressing is so yummy, we love it! According to The Deen Bros., any extra dressing can be used as a dipping sauce for chicken fingers or chicken wings, and can be covered in the refrigerator for a week. We like all the flavours in the dressing; the garlic powder, onion powder, black pepper, minced garlic, chopped fresh chives, parlsey, mayonnaise, milk and white wine vinegar. The only thing I omitted was celery seeds, since I did not have any. I do agree with The Deen Bros., this dressing would be great as a dip for crispy fried or baked chicken. To serve this easy salad, drizzle some dresssing over the salad, toss gently and enjoy! I would definitely make this dressing again, to enjoy with some fried or baked chicken the next time. For the dressing, whisk together the dressing ingredients; set aside. For the salad, chop the lettuce into bite-size pieces; place in a bowl with the tomatoes and cucumber. Toss salad with just enough dressing to lightly coat the greens (reserve extra for another use). Serve immediately. Cook Like A Star event, featuring Paula Deen and The Deen Brothers, hosted by Zoe of Bake For Happy Kids, Diana of Domestic Goddess Wannabe and Joyce of Kitchen Flavours. 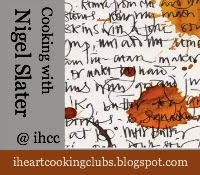 "Budget Friendly Dishes", is our theme for this week at I Heart Cooking Clubs (IHCC), where we are cooking from Nigel Slater's recipes. I was browsing thru his two books, The Kitchen Diaries, and this recipe caught my attention weeks ago. I made this for my lunch, and have scaled down the recipe for one. I have used 3 medium-sized chicken wings and instead of water, have used my homemade chicken stock (about 3 cups). A quarter of a lemon is just right for the light lemony taste. Season with salt, and Nigel says to season generously with black pepper, and he is right! I do not have any angel hair noodles, and have replaced it with Chinese wheat vermicelli (misua), which is great in soups. A bunch of chives from my potted garden completes the ingredients for this noodle dish. The chives are left whole as it is, as according to Nigel, it is an idea from James, his friend who says, "Then they'll get tangled up with the noodles and make them more interesting to eat". According to the recipe, the chicken wings are fried in 1 tablespoon of oil on both sides until they are browned, add in the cut lemon, let the cut side of the lemon browns a little, then add in the water, let it come to a boil, then simmer for 45 minutes. Frankly, I do not know how he did it with 1 tablespoon of oil to fry all the 8 wings for the full recipe, but I've used a few tablespoons of oil for 3 chicken wings! But not to worry about all that oil, what I did was, I fried the wings on both sides till they are brown, one at a time, so that I do have to use so much oil. Then I drained the wings on kitchen paper towels, and place them in a clean saucepot. Fry the cut side of the lemon for a minute with the last chicken wing and add that to the saucepot with all the wings and my homemade chicken stock. So there's really minimum amount of oil. I simmer the wings for 30 minutes instead of 45 minutes (I was hungry! haha! ), add the wheat vermicelli, chives, season with salt and lots of black pepper, letting it simmer for about 3 minutes, until the noodles are have softened and cooked. Ladle into a bowl, and eat it while still hot. My notes : Really nice! I ate this with some chillies from my potted garden, sliced and mixed with some soy sauce. The broth is really nice, especially since I've used my homemade chicken stock instead of water, and I like the light lemony taste of the broth. I did not squeeze over anymore lemon juice over the noodles, as it is already good as it is. Having the chives whole as it is in a soup is really a very Chinese way of eating it, as chives are usually left whole when it is cooked with Chinese wheat vermicelli, which is usually cooked when celebrating a birthday for the elderly, as it represents long life with many more birthdays to come! Warm the oil in a large, deep pot. Add the chicken wings and brown lightly on both sides. Halve the lemon, add half to the pan and cook till the cut side colours. Pour in 1.5 litres of water, bring to the boil, then skim and discard any froth that appears on the surface. Simmer for 45 minutes. Skim once again thoroughly. Season with salt and, generously, with black pepper. Drop the angle hair noodles into the pan with the chicken, push them down into the liquid, then add the whole chives and cover with a lid. Switch off the heat and leave for four or five minutes. Divide the chicken wings between four shallow bowls, add the noodles and chives and ladle over the broth. Squeeze in the rest of the lemon.